To her dismay, Lucy discovers she's put on 22 pounds since marrying Ricky. Ethel: 'On behalf of the tubby trio, I welcome you to our flabby foursome.' A phone call from Ricky's agent reveals that Joanne, a singer featured in Ricky's Tropicana nightclub act, is getting married and will be quitting the show. Needless to say, Lucy wants the job. At auditions the next day, Lucille McGillicuddy (Lucy Ricardo) can have the part provided she loses 12 pounds in four days to fit into the ex-singers size 12 outfit. Lucy tries jogging ('the fourth-floor dash'), but loses only 5 ounces. At dinner, Lucy munches celery while Ricky and the Mertzes dine on steak and potatoes. In a funny scene, Lucy wrestles the Mertzes' dog Butch for a scrap of meat..
With only five hours left in which to lose 5 more pounds, Lucy resorts to a 'human pressure cooker' (a steam cabinet), finally weighing in at the required 120 pounds. Hours later in the nightclub act, Ricky sings 'Cuban Pete' and Lucy warbles "Sally Sweet'. She's a hit, but after the show, she collapses, suffering from malnutrition. Special Notes: The songs were featured in the Arnazes' 1950 vaudeville tour. This was the first of many on-screen appearances for Marco Rizo, Desi's longtime pianist. 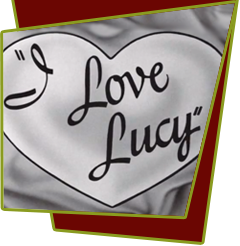 This episode is based on lucy's radio show, My Favorite Husband, Episode #123 ("Iris and Liz's Easter").